Location: in the IU School of Education – First Floor atrium by the library. Just east of the Jordan parking lot. 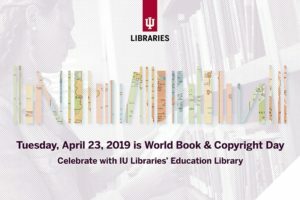 Breanya Hogue, IU PhD student, will share her experiences publishing her picture book that reminds us to know and understand young people as individuals: Act Your Age, Shawn Trenell! Patsy Rahn, founding member and chairperson emerita of the Writers Guild at Bloomington, will read poems from her thought-provoking anthology The Grainy Wet Soul. This includes a free-flowing open mic time where you can read a poem you wrote, or read a poem by someone else. We will have poetry books available so you can find a poem to read. We’ll have books with vivid titles from the Ed Library’s collection. Grab the ones that speak to you, stack them up in a meaningful way, and document your #BookSpinePoetry on social media. Exercise your right to Fair Use by repurposing a copied page in a book written by a nationally recognized Education scholar. You’ll scan the page and circle meaningful words; connect them in a visually compelling way; and document your #RedactedPoetry on social media.